I initially played a bit of everything: from Destruction Derby to Carmageddon's focus on more combat than racing, from the more pure experiences of the endless Need for Speed titles to Screamer. If it arrived on PC, I probably had a go on at least the demo. On the MegaDrive it had been the likes of Out Run, Virtua Racing, and Super Hang-On that kept my attention. But, by the time Forza started out, I'd settled into some early-2000s series that stood out. Burnout was just getting started, pure arcade handing and innovative exploding puzzles. Midtown Madness was going back to the more open checkpointing of something like Carma that later defined Rockstar's racing attempts, amongst others. Sega GT didn't quite connect for me but the Dreamcast had been where Metropolis Street Racer and San Francisco Rush 2049 took hold. The more relevant of those two to Forza, MSR had also spawned two Xbox sequels under the Project Gotham Racing name before Forza even arrived, and PGR3 was known to be coming for the new console out that year. While not aiming to be realistic, PGR had helped teach me I needed surround-sound for driving games just to hear where the car behind me was before a corner. Those lovely drifting corners that felt a million miles away from the arcade grooved arcs of Mario Kart or Ridge Racer. The other series that was letting me know the importance of audio positioning was TOCA Race Driver (later named GRID). Two games deep before Forza arrived, this was where I probably first got a serious taste for something less arcade-y. PGR was at least demanding you brake for the corner and plan your trajectory, but the TOCA games pushed that a bit harder and asked that you not sweep the back end out as you did it if you wanted to keep pace. By no means a sim, they did expect a bit more and set those expectations on real-world tracks - something which allows driving games to tap into your memories even between series as you know every corner of a track layout after playing it over several different series. Finally, I can't end this pre-Forza introduction without talking about RalliSport Challenge. Where Colin McRae Rally had never quite captured me and Sega Rally had been some fun I possibly didn't fully grok at the time, RSC felt like it arrived just in time for me and was everything I wanted from a timed challenge on a set of tracks you needed to learn. Like PGR2, RSC2 leveraged the new Xbox Live system for online and, crucially, leaderboards to compare my times to everyone I knew. I still read lots of references to the series as a high point for rally games and there are a lot of giants in that genre it competes with. I enjoyed the original Forza well enough but I wasn't throwing tens of hours into the series on the original Xbox. Therefore, I don't actually have particularly strong memories of the first game, possibly in part due to it coming at the very end of the generation. Likely more relevant was all the far more arcade-y racing and driving titles I'd played before this, detailed above. This game seems to be seen as potentially a slight low point in the unbroken chain of the initial four numbered titles. Moving to a new platform but without radically pushing forward from the original strong showing. My memories of the game are of a launch window 360 that was dying by the summer of 2007. My online profile doesn't even record that I played this game, because the networking had already died on my 360 before it arrived. Offline only, leaderboards were gone. But I continued to enjoy the series with the difficulty assists on (effectively arcade-ish mode), but now really taking advantage of that dynamic racing line that allows you to learn a track without being terrible at each corner before you get a feel for the braking point you need for each car. An assist that allows you to drive at least somewhere close to passable on your very first attempt at a track: these are the teaching touches that let me really get into a game. Rather than making the game easier, it removes a stage of forced memorisation from being good at taking each track with each car. Of course, trying to go back now is rather challenging. The AI instantly feels retro, with their driving a lot closer to being that classic on-rails (and non-reactive) design than later iterations. Just at the very basic level of controls, Forza 2 forces you to unlearn use of the clutch, because there is no manual with clutch option so the manual control arrangement puts the handbrake where most players now expect a clutch button. There are no in-car views to drive from (to perfectly spacialise the audio feedback for surround speakers and give an impression of the car's corners). Quality of life additions like rewind (to reverse a mistake or an AI blindly ploughing into you as it doesn't react to your clear positioning) and a career progression that focuses on providing choices (or even just race competitors that always correspond the car you bring to the track) is also very noticeably absent from the package. This where they really got me. This is the start of my phase of easily dropping 100 hours into a Forza game upon release and then going back for more every now and then until the sequel had arrived. Just as Forza 2 had made the racing line a dynamic indicator to avoid needing to memorise braking points for the standard racing line, this game added the rewind assist. And what an addition that was, even if we'd already been playing games that gave limited access to that feature from Codies the year before. TOCA Race Driver was now without that brand association and called GRID but in 2008 they came out with Flashbacks - a rewind that meant if you messed up a corner then you could go back and try it again. Turn a race-ruining mistake into a second chance to keep going to the finish line. Colin McRae Rally was now called DiRT and also added the same assist, giving Codies two runs at the formula before Turn 10 had a chance to release their attempt. The difference here, compared with Codies' system, was that you weren't limited. Turn 10 let you go wild with racing the perfect lap - if you had the patience, you could drive how you wanted. But it wasn't a clean lap. And this is a small stroke of genius for how this assist worked to give you more time racing on the edge without breaking the leaderboards with your friends. Cut a corner, use another car to change direction, draft for a boost, or rewind and your lap time was flagged as dirty. The leaderboards not only ranked your best laps but also automatically ranked clean laps above dirty ones. Even the slowest clean lap was worth more than a dirty one. You wanted to rewind to avoid disaster and being forced to restart a race but the leaderboards at the end were all about getting that clean lap. They also noted which assists you had on when you got that lap time. This was the start of my journey into getting the depth of the simulation in the Forza games. The lists of top laps not only strongly encouraged me to worry about cut corners and making that one perfect lap (without using the rewind to fix a mistake) but also showed how all my friends were doing with assists on and off. After a while, I started experimenting with turning down the assists and seeing how the various cars handled without the more arcade edge. By 2010, I realised that with rewinds there to undo mistakes, I could experiment with the cockpit view and started to get a taste for it and the kinetic feel of that view. And here, here is where it all really came together. Forza 3 had captured my attention and put me on a path to wanting to know how the game was meant to be played, how the fake cars provided detailed feedback to do more than throw them through a corner and hope for a good exit. The dual games of starting off in the pack and working through the other cars cleanly and quickly before racing the top spot, then driving into the sunset to get those clean laps for the leaderboard comparison at the end. Checking for more optimal paths where the racing line was too conservative or suggested braking where it wasn't required. The big innovation here that brought the series and how I played it into alignment was Car Clubs. World or even region ranked leaderboards are pointless, I've not got world class reaction times and I'll never be able to compete at that level even if the developer is keeping them completely cheat-free. Friends are where it's at. But I only have so many friends who play driving games and sometimes I'm playing quite early on after release and an empty leaderboard is no good. Forza 4 split the difference and provided a way of joining up with enough people to always have a leaderboard with some competition without it just being anyone. I joined a club with all my friends and got to know a few new names that became my regular competition for the better times. I started out in 2011 with assists already scaled back somewhat from the end of playing Forza 3 but during my time with Forza 4, I definitely started to push further into the higher classes without going back to the assists to manage all that power. This was all automatics but I was otherwise clean: no ABS, STM or TCS. Using a basic joypad, the steering was on normal because you need to be able to flick the stick to make small adjustments while it damps the input to take that as a small wheel turn too fine to make on a basic thumb stick. Earlier I noted that by 2005 I knew surround was essential for hearing the engine of the car behind me to know which side it was potentially going to attempt to pass on. By 2011, I had moved to only use cockpit view so started out with Forza 4 that way. And I got much better at using my ears to get a better feel for an assist-free way in which Forza tells you what you need to do. 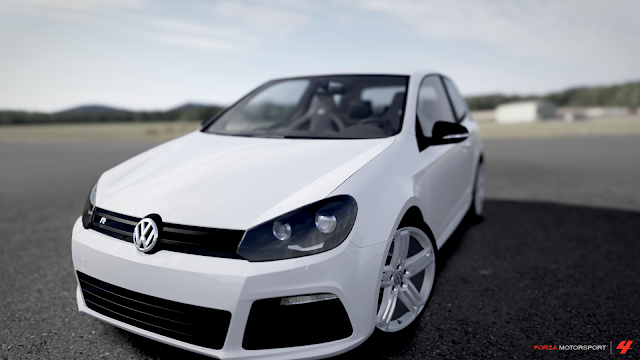 I'd not grasped this so clearly in Forza 3, starting out with assists (even for the slower cars) and an external view. Front speaker for your engine, four surround speakers for each tyre. Each one shouting out information about where the braking or acceleration is going to let go and how likely you are to hold this turn at this speed. Perfect. This was where Forza started to lose me - not during Horizon but immediately after it. The cadence of the series stepped up to annual releases and jumped to a new platform the next year. This game was great, from the open world to the soundtrack framed around a music event. I played it intensely but five days after the game was released in Europe, I'd completed every event and seen every hidden spot. A few days later I'd polished off all I cared to of the simultaneous online experience, only lacking the Free Roam achievement (as those seemed to be a poor copy of that idea from Burnout Paradise, where I did enjoy them several years earlier). Horizon showed that the Forza handling model could be extended to allow tyres to touch something other than tarmac without destroying the feel. The assists may have been cranked up a bit and everything made more forgiving but it still felt like a Forza game. Making things more forgiving (the Horizon off-road handling was never aimed at simulating real sports cars on grass or gravel but rather making the game exciting to play) is not surprising when adapting a model that had previously said a tyre that touched off-track instantly lost all traction and two wheels or the underside of the car touching grass or gravel would instantly apply a massive magical braking force to the centre of the vehicle to try and avoid corner-cutting - a magic decelerator you can still find in spots in the latest FM games to avoid off-track cheating. One of the big changes for Horizon's handling seems to be that all vehicles had super-brakes - it takes a moment to get used to it but clearly helped in rapidly dealing with unexpected traffic or track changes. With assists off, Horizon provided a huge range of differently handling vehicles and a great range of courses to throw those cars at without it ever feeling too much like your choice of vehicle was fixed by the event's terrain. Horizon had a great day-night cycle and some gorgeous visuals for the location on the 360. To this day, it still stands up surprisingly well and the low resolution of the 360 is offset somewhat by decent anti-aliasing and a soft look that masks how little processing power and texture space there was for those real-time shadows that came from a day-night cycle. In writing this, I went back to try the DLC I'd missed during that single week of play in 2012 and see how much more was added to the game after I stopped playing. A clever free DLC called the 1000 Club offers a short list of challenges for each vehicle that effectively extends how much you can do in the open world while feeling rewarded. I can now say that I've enjoyed flipping through the handling of at least 146 different vehicles in Horizon in the last few days. All done now with manual clutches, which also gave me a greater appreciation of the range of handling (and even ease at which you can read the actual car's dashboard for information vs using the game's UI or just working purely on audio feedback) for that system. It's a smart addition that would have kept me playing for longer if it had been there at launch. The main DLC/expansion (beyond the car packs that often feel superfluous) is some rally events and a new off-road handling pack that added a few extra parts for each vehicle to allow the handling required for some nice rally feel. I had a lot of fun here, especially after I turned off the braking line assist that appears to not have been tuned for the new rally parts and offers some pretty questionable advice. One of the really weird things is they made the rally expansion for you to lose (in a game and series otherwise all about you dominating the pack). 50 cars in each event with the need to do reasonably well to progress and unlock all the rally events but never the need to get to the top. Even going for Hard rather than Unbeatable, I was getting comfortably into the sharp end of the global leaderboards (top few percent) while also losing out to the top AIs. Fighting my leaderboard rivals (at the sharp end of my Car Club or from the global pool if I'd already topped that crew) was often easier than coming above the AIs one notch below the highest difficulty. It's a small touch but I found that an interesting choice (you can obviously drop the difficulty if you want some AI times that you'll find it harder to be much slower than on Easy). Unfortunately, you can also see some of the ways the series was going into paid cheats appearing here. The 1000 Club repeatedly offers to unlock fast-travel anywhere if only you would pay some real-money currency (on top of the game already offering to unlock cars for real cash every time you go to spend your in-game credits - as I noted in 2012) and the Rally expansion tells you that while the events have to be unlocked in order and a points score exists for the final event, that only really matters if you're not prepared to use real money to unlock them all now. The events seemed easy enough to unlock but offering to remove that with cold cash paints the challenging nature of that expansion in a far less favourable light. Then the Xbox One happened. An underpowered and overpriced system focussed on an American TV customer that got hit doubly hard in Europe due to exchange rate moves. This was more expensive than a launch PlayStation 3 where I live and was clearly an inferior model of PS4 with different exclusives. It wasn't even as if it was a strikingly different silicon design. MS paid AMD to put a cache in rather than a 50% larger GPU and opted for weaker memory bandwidth to guarantee they'd get 8GB from the first plan to enable a larger OS footprint. Forza 5 launched with a severely cut back selection of content compared to the last Motorsport game as they moved to higher fidelity assets. I had a quick poke around on a friend's copy and decided to wait two years for the version packed with more content. They even doubled-down on the paid cheats and broke the progression curve to try and force more players to pay for currency, something I'd noted was starting to fester in the series when Tokens got added to Forza Horizon. This failed to recapture the magic of the first game for me. I wrote at the time "more devoid of life than the original, certainly a weaker sequel" after a few hours of play. I was quite happy to live in the somewhat more arcade-y (especially with those strong brakes) world of DriveClub that year, with dynamic weather and time of day making every race into a dynamic discovery of exactly what the track had to offer. 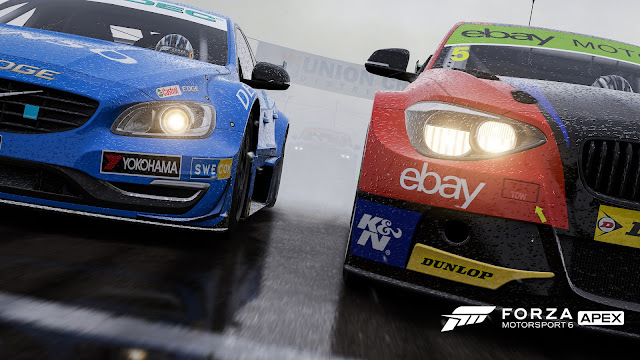 Last year offered up Forza Motorsport 6 (XB1, 2015) with the promise that the progression has been walked back from the almost F2P-inspired design of Forza 5. But the console was still not priced well and I was happy to continue with DriveClub and jump into DiRT Rally. So here we are today. Forza runs on Windows 10, at least in a free (and currently in beta form) variant to test the waters. This post is already getting rather long so we'll save the review for part two of this series. There are some major issues that come out of this being a stripped down experience. There are some issues which may reflect poorly on the series as it diverged from my personal perspective of achieving a peak in Forza 4 (and the path it didn't take towards perfecting that specific design). But I am now using a manual gearshift and flirting with moving the AI difficulty from Pro to Unbeatable (a tier missing back in Forza 4), so it appears to be back to pushing me to go deeper even with those issues nagging at me.